Like a thief in the night, Michael Mann’s directorial debut sneaks in, does its job, and gets out with no one the wiser . . . until later, when you realize how expertly it was handled. 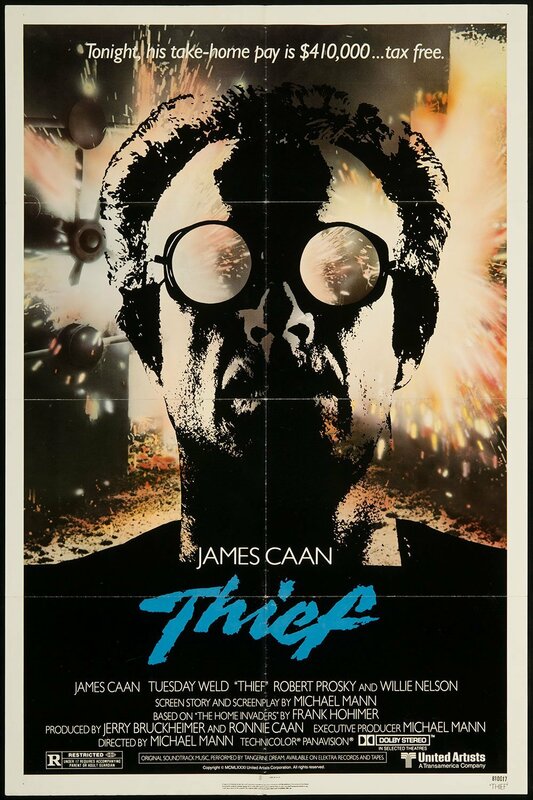 Thief (1981) is an accomplished work that examines the seedy underbelly of Chicago through the eyes of a safe cracker and his crew. 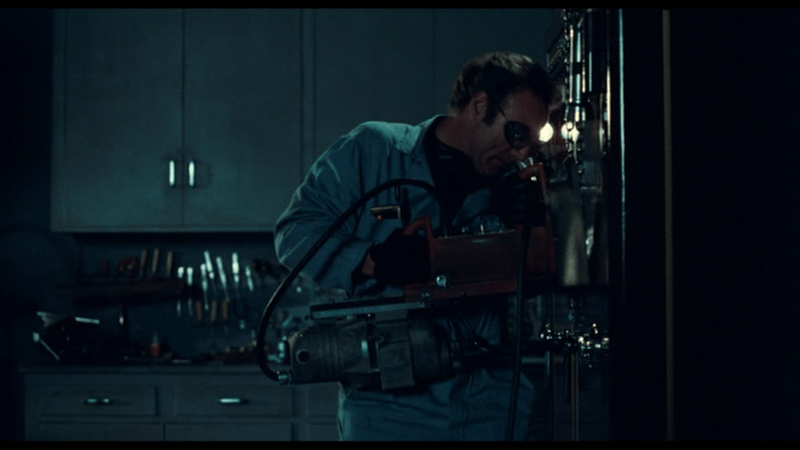 While locked up for stealing $40, Frank (James Caan) befriends a fellow inmate, who teaches him how to break into safes. After he is free he makes a name for himself by becoming an expert thief. At the start of the film we see Frank and his crew breaking into an office and stealing diamonds for a local fence. However, before he and his crew can get paid for the job, his fence is killed and he instead has to work for a new boss on one final score. There’s a certain look to a Michael Mann film, and it all started here: rain so dark and neon so bright you feel like you’re entering a completely different world. Mann has carried this style through all of his films, and it has even influenced other directors. I don’t think we would have the rain-soaked streets in Ridley Scott’s Blade Runner or the grim and gritty Gotham of Christopher Nolan’s Dark Knight films without Mann. 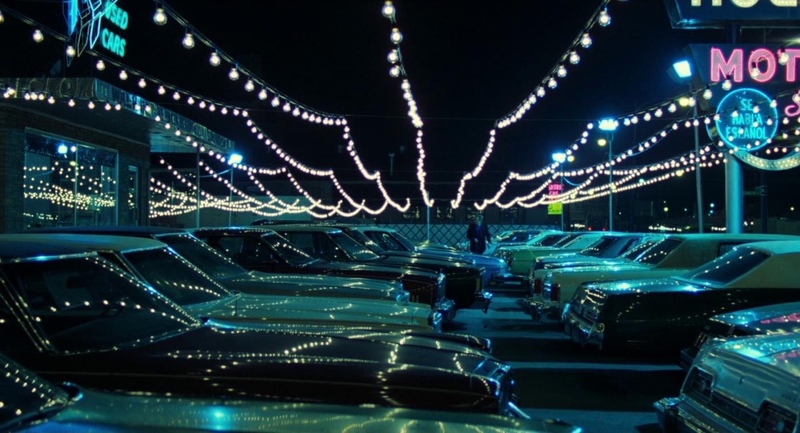 Darkness, neon, and ’80s cars. Looks like fun. Besides just the visual style, Mann has certain thematic elements that he likes to delve into. One is the honorable crook who is willing to drop everything if the caper gets too hot, which also can be seen in his films Heat, Collateral, Public Enemies, and Manhunter. The lead also tends to be a man’s man: cool, collected, glib, and an expert in his field. All of these things can be found in Thief. The one thing that can’t be found typically is a strong female, which can be an issue. Mann’s women tend to be props for the guy, and they don’t have a lot of effect on the story. In this film, we’re presented with Tuesday Weld, who plays Jessie, A cashier who has caught Frank’s eye. In one of the great scenes in the film, we learn about Frank as he recounts his history and outlook on life to Jessie, who he has pretty much kidnapped. (This scene also happens to feature something else Mann tends to like—conversations set in diners.) He lays it all on the line and Jessie goes with it; thanks to Caan, the scene works, but it’s not as strong a turn for Jessie as it could have been. This is coming from a modern viewpoint, of course, and probably wasn’t as weak a turn for theatergoers in ’81. Tuesday Weld and James Caan in a precursor to DeNiro and Pacino in Heat. This is James Caan’s film from start to finish, though, from the opening robbery to the heist in the middle of the film to the inevitable leave-nothing-standing conclusion. He is electric on the screen, and in addition to the diner there’s another great scene that conveys so much of Frank’s life and where he came from by showing him and Jessie trying to adopt a child and getting blocked by the system that spit out Frank himself as a child. In real life, Caan was even taught how to break into safe’s for his role by a former thief, John Santucci, who interestingly plays a corrupt cop in the film. Besides the great acting, though, the heist scenes are well shot and show just how professional these guys are. The big heist at the center of the film reminds me a lot of the amazing 30-minute silent heist in Jules Dassin’s 1955 Rififi, which I would also recommend. Caan broke into this safe for real. I should also take a moment to call out the synth soundtrack by “pop” group Tangerine Dream. If there is one band that scored and influenced the most ’80s films, it would have to be this German electronic group. For Thief, the aural soundscape that they create really brings you into the film and mixes well with the darkness and the neon light trying to puncture it. While it is a strong, bravura performance by Caan, I can understand this film might not be for everyone. If you like heist films and neo-noirs, it will be right up your alley, but if you’re looking for fully fleshed-out secondary characters, you’ll probably want to look elsewhere. This film can be found on a heavily cleaned-up Criterion DVD and Blu-ray release. It is currently available via Netflix DVD rental, but not streaming. Feel free to discuss further in the comments below; just keep it respectful. Let me know if there are any films you think TBT should cover in the future.